As things get a little cooler and slightly more chaotic during this holiday season… keep your core warm and your mind focused by steadily practicing this month’s pose, Bakasana! Crow pose is a great way to strengthen, expand, and increase your ability to remain centered both physically and mentally. By focusing on the alignment, actions, and sensations of this pose, you will be carried into the present moment and lifted up from worrying about the past and grounded away from anticipating the future. Hopefully these following queues for Bakasana will help you create activating intentions with greater clarity, calm, and power! So that you may access a deeper sense of space and strength within your spine, core, and arms. Crow pose asks for your hips to be in deep flexion, your low belly to be activated, and your arms to be sturdy; therefore, practicing these postures before you enter into Bakasana will appropriately awaken and ready your body for what’s to come. Soften your hips and spine into flexion by breathing deeply into your lower abdomen and lower back while in child’s pose. Awaken the muscles of your abdomen, arms, and hip flexors with these two effective core poses. Cultivate steadiness of mind by meditating in Malasana before heading into your Bakasana balancing practice. Now dive into a Bakasana practice that makes the most sense for wherever your body and mind may be at during this time of your life! Remember to stay rooted in the present by activating clear intentions that will help you resist the urge to focus solely on judging the outcomes of your practice! May you feel empowered to practice at your own pace and in your way this holiday season! Best of health and harmony. Our bodies are expressions of where we’ve come from (what we’ve been through) and where we are striving to move towards; therefore, all bodies and expressions will look drastically different from one another regardless of how similarly we place our bones and engage our muscles. It is not so much about the aesthetics of the form as it is about the sensations of flow that we are attempting to cultivate within these postures. Therefore these images that proceed are not intended to create an ‘ideal’ of what your practice should or should not look like, instead these images are intentionally being used as a means to communicate abstract ideas about anatomy via a more relatable format so that you may be guided into your exploration of this posture verbally as well as visually. When did y’all start practicing yoga asana and what inspired you to begin? P: I started practicing about a year and a half ago, and it was because of Erin. She moved back to town after college and found this yoga studio and said, “Hey Mom wanna go to yoga with me?”. So, I did! E: And now you still go! P: [laughing] And now I still go to yoga! Brought here by my daughter. P: Well over my life I have tried to find exercise that I could commit to and it’s always been really hard. I find that I like doing things with a group more than doing things alone. I’m not really good at going to the gym everyday by myself..
E: And that’s just boring..
P: Yoga became something that I really felt like I could commit to! And it helps that we come together, but I come a lot by myself too. E: Yea it was cool when you started going by yourself. P: Yea it was cool! And I think what kept me coming back was that the practice was just as mental as it was physical. It really alleviates my stress by how it calms and focuses my mind. That’s really wonderful to hear you have such a holistic experience with the practice. What about you Erin, when did you start practicing? E: Umm I feel like a lot of young girls are pressured into having a diet and fitness routine that isn’t necessarily centered in self-love as much as it is about having to look a certain way.. And when I was in college I got into all of these different fitness regimes that were just all about aesthetic, and I could never commit myself fully to that. But when I moved back home to New Orleans and found this studio.. It really surprised me just how active yoga is. I always kind of thought of yoga as this passive kind of meditation, and I also never thought of yoga as something that I would bring into my life daily. And what really got me hooked on it was the mental and spiritual aspect of the practice. Before yoga I would think to myself “ugh, I have to go exercise today” but now I think “wow, I get to go exercise today”. I love myself, ya know.. And so I enjoy coming here because I want to set aside time to take care of myself fully. P: And what I like about coming to Reyn is that I feel very comfortable just being who I am and doing whatever level I can do, and it’s not competitive. If the guy next to me is standing on his head I don’t feel like I need to do that and I feel like that ties into what you were saying [Erin] about needing to workout so that you can look a certain way… I feel like there’s freedom from having to hold your stomach in or [freedom from thinking] oh somebody over there looks thin…. And I don’t… it’s freeing. P: That’s another thing- what is mentally “harder” is not necessarily what is physically “harder”. So that [aspect of] failing doesn’t [feel] present in my practice... This is the first time in my life where I have come to a place where I can show up, feel fit, and feel like I belong… like I can be myself… And [that] feels really good… I feel stronger! That’s amazing that y’all feel supported in this space. In regards to the physical aspects of this practice (especially as women) have y’all felt that cultivating body-awareness has positively or negatively influenced your relationship with body-image? E: And I’ve also realized not only how much I judge my own body but how often I go to judge others… And yoga has taught me that you can’t judge someone’s strength by what they look like… because [strength] is so much more about the level of presence that you're bringing to the practice. So [for example], an older person who is less active can have a much more fulfilling practice than a younger more athletic person. You know what I mean? P: Yea and understanding that building that kind of physical and mental strength is something that is [accessible] to anyone at any age… because it has to do with the commitment you’re making to [continually] showing up and being present. How has the practice of being present affected your lives off the mat? P: I think the mindfulness you cultivate on [your] mat translates over into everyday life... I was always a person who was high strung and anxious and… yoga has been a definite game changer for the anxiety and stress.. I just feel much more calm and centered. I have had times where I have been really upset and I come to yoga and it just takes… the drama out of my stress… I’m more settled. E: I dig that… This is gonna sound kinda dumb… but I feel like I never thought about breathing before I came to yoga! [laughing] I really don’t feel like I ever thought about it as a tool… I always just thought of it as a result [for example] if you get nervous you start breathing faster… but you can also get nervous because you start breathing faster! So coming to that realization of your emotions [being a result] of your breathing pattern really changed the way I more [healthily] relate to my emotions… And I find myself practicing uji breathing when I started to get stressed and it really helps calm me down! And finding just how accessible focusing on your breath is no matter is going on… is really amazing! P: Yea and I think that practicing [yoga] several times a week gives me that [deeper] awareness [and connection to] to my breath. E: And that awareness [can] carry over to your daily life… instead of making it exclusively just for when you’re on your mat. What are some of the most challenging aspects of this practice for y’all? P: Absolutely… and one of the things that is great about yoga is that you are responsible for your own practice. The teachers are basically guides, but you’re responsible for whether you come or not come, whether you be present in the poses or be [distracted with] trying to show-off, ya know? You’re responsible… you’re finding your own way just alongside people who are guiding you. E: Yea and everyone is in their own practice and on their own journey so it’s not really your place to judge people… also that [way of non-judgment] can [be] extend to the postures… not thinking that one posture is more or less than any other, you know? 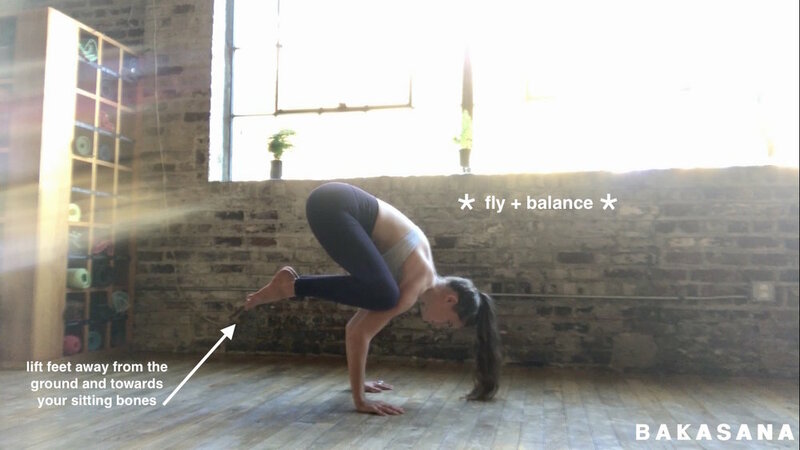 Mountain pose is just as significant, real, and legitimate as a handstand… they each have a specific purpose and value… and practicing handstand isn’t [inherently] better for you and healthier for you just because it’s “harder” to do..
[laughing] Yea mountain pose is actually my favorite pose! P: It’s a just really emotional pose for me... I feel like I get to let go of a lot of baggage… in all of the poses, but particularly in pigeon. And has practicing yoga together evolved y’all’s relationship as mother and daugher? P: Yea and [since Erin is now] a young adult it feels like we’re just two friends, two women, doing yoga together [and that] feels special… we get to connect in a new way. [laughing] Well any last words of advice y’all would give someone wanting to come here and try yoga for the first time? E: I would say try the community classes… those are always filled with people of all different levels and ages…. And bring a friend! They’ll be able to laugh with you if you fall on your face! E: And laughing at yourself alone! Release and let go of stagnant energy that is no longer serving you this fall ~ by diving forward into a deeper journey and understanding of this November’s pose of the month, Prasarita Padottanasana. This posture, not unlike many other inversions in yoga asana practice, helps to stimulate your internal organs, revitalize your systems of digestion and circulation, as well as increase blood flow and oxygen to the brain. In regards to the musculoskeletal system - prasarita padottanasana may aid in strengthening several joints and muscles in your body i.e. arches of your feet, your ankles, knees, quadriceps, and other hip flexors; as well as lengthen many joints and muscles in your body i.e. calves, hamstrings, groin, and one’s entire spine! And as this pose alleviates restrictions in your body, the potential for releasing restrictive patterns of thought, feeling, and perceiving arises ~ therefore allowing your entire organism to receive the holistic benefits that can come from practicing the posture and art of letting go. Traditionally there are four different expressions for the arms to embody in this posture : A, B, C, and D.
With whichever expression of the arms that you choose to embody ~ practice breathing length into the front of your spin with every inhalation and breathing strength and stability into the fronts of your legs with every exhalation. Notice and enjoy how these actions provide the back of your spine and legs with more space! If your palms are unable to make contact with the ground or if the tightness in your hamstrings is restricting you from finding full length in your spine → welcome props into your practice props! Place your blocks on any height they need to be so that you can place your palms onto their support ~ and bend your knees as much as you need to so that you can extend your spine despite the restriction in your hamstrings! Lastly if you would like to play around with transitioning out of prasarita padottanasana and into pincha mayurasana (forearm stand) ~ a block in between your palms can be super helpful in keeping your arms activated as you begin to rock your hips over shoulders and fly your fit over your hips! When did you start practicing yoga and what inspired you to begin in the first place? I started practicing yoga regularly during the last year of my masters program… so about four years ago. The reason I went was because my ex wanted to go to yoga and was embarrassed to go alone so I was just willing to tag along! I was like sure I’ll go with you and embarrass myself.. and I really did! One of my professors was in the class… which was somewhat mortifying ummm [laughing] I went initially to be supportive… but I ended up really enjoying the breathing exercises, which became my favorite part of the practice, and which was what kept me coming back. Off of that breath note- how have you felt like this practice has transformed or influenced your relationship with or understanding of the mind/body connection? This practice has taught me that I can manage my state of mind through breathing exercises. Focusing on my breath and trying to lengthen my breath can really calm me down and get me out of my head a little bit… For example if I’m having a bit of a fit of rage at traffic I can sit there at the light and just count the length of my inhales and exhales until the light turns, and I won’t end up screaming at anyone... [laughing] So, that’s definitely a transformation! I mean I’ve always found there to be a relationship between how I feel in my body and my state of mind but I think certainly with yoga, that’s kind of the purpose of the practice…. In yoga I think I am more consciously engaging with this idea of ‘what i’m doing with my body will have an effect on my state of mind and my emotional well being’ and that is a big part of why I come. Do you feel like this practice of reconnecting to your breath is always accessible regardless of what state of mind or body you may be in at the time? Yes, and that’s why I come every morning. I like to wake up and start the day on a good footing. I like to come here and get myself in the right frame of mind to go about the rest of my day, which doesn’t always last the whole day [laughing] but it always feels good to at least start at that point! [laughing] Oh yes I can relate! What are some ways that your practice has positively shifted your behavior and mood not just on, but off of the mat? I mean…. my blood pressure is down! Which is a good thing. Yoga can [also] have a pretty profound impact on how I view a situation. I don’t want to say it changes my world view entirely, but I do feel like it has really improved my ability to not be completely emotionally reactive to things.. and [instead] ask myself ‘why am I reacting this way?’, ‘Is this reaction going to be healthy or constructive?’... and usually I think, ‘well nothing is going to come of that [reaction] so just breath a little bit and rethink’. And in terms of work… one of the studies I was involved was introducing yoga to an elementary school as a way of trying to help address students’ stress, and so [it] has certainly bled over into my research interests… and so yea, [yoga] has had a pretty profound impact on my life. You know I can’t say that like everything in my life has changed, but I do think this practice has certainly been a force of positive change in my life in a couple of different ways. It’s allowed me to aspire to be better at engaging with my emotional state and not just giving into it. And I feel a whole lot better when i come to yoga; I feel healthier! And there’s a positive social element as well when coming to a studio and talking with the instructors and fellow practitioners. So it’s really holistically beneficial- or least that’s what yoga has been like for me. That’s all really wonderful to hear! Would you mind sharing any challenges that you personally face in a yoga class? Yea, I find it really challenging to focus just on myself when I’m on the mat. With there being other people in the room and a big set of mirrors on one of the walls, I can be very and easily ego-driven... I catch myself trying to look in the mirror to find out if I’m doing this pose better or worse than everyone else… So that has been a challenge for me.. But I think that yes it’s challenging, but also sort of part of the point… You’re never going to be completely free of distractions in life so part of the practice is learning how to more healthily engage with those distractions… you know acknowledge them, but don’t focus on them. But it can be frustrating for me because some days I just keep looking at the same person because I feel competitive with them or I catch myself tensing up because somebody is making a certain kind of noise that makes me mad [laughing] - but that challenge is an integral part of why I practice yoga… I’m learning to turn my focus inward.. and constantly learning how to engage more mindfully with myself in the presence of distraction. In that vein of learning how to engage with the world more mindfully amidst the chaos and flood of distractions - how has your relationship with yoga influenced your ability to adapt to the sociopolitical transitions of 2017? I have a feeling you will! And thank you so much for sharing and willing to be a part of a conversation. Any last words of wisdom or advice you’d like to give to a beginner yogi who is anxious or nervous about showing up and beginning their journey of practicing yoga? I mean yoga really is a practice for everybody. You don’t have to be flexible, you don’t have to have good balance, lord knows I don't’! I have been practicing for years and I still really struggle with balancing poses! This isn’t about you compared to other people it really is just about you and how you feel. And sure the other people in class will look at you, but they’re really not focused on you… you know you may have this sense that everyone’s eyes are on you but they’re not focusing on you... we are all trying to focus on ourselves. It’s natural to worry about making a fool of yourself, I mean I fell flat on my face in my first yoga class and I get embarrassed easily... so if I can keep coming back to yoga after my first experience - I think pretty much anyone else can get passed whatever initial embarrassment they may feel and learn how to really enjoy this practice. You may feel perhaps a little insecure and out of place at first but pretty much any studio you go to is going have a great roster of thoughtful teachers who really want to help you, especially here! I’ve taken classes with almost all of the instructors here, and I can’t think of one class where I’ve thought I will never do that ever again... everyone has their own style and things that they like to focus on and talk about and it’s really just a matter of finding something that fits you. So if you don’t like the first class you take, go try a different one! There is no limit to the ways in which you can express yourself in yoga, so you just have to take the first step and try it. Access a deeper understanding of and appreciation for your downward facing dog with these brief but helpful tips and insights! As being one of the most frequented postures in an asana class, adho muhka svanasana has the great potential to enliven and restore your body back into integrated balance and wholeness; however, when not practiced mindfully it also has the potential to cause chronic harm and inflict injuries onto your wrists, shoulders, neck, and back. Therefore taking the time to learn about how to more efficiently place your bones and how to more effectively engage your muscles in downdog is critical for a yogi’s health! Without there typically being enough time in public classes to really (and nerdly so) break all of this anatomy down - this virtual space is here to provide you with the information that you may be looking for in order to explore more safely and receive more deeply the full range of glorious benefits that downward facing dog has to offer your body and mind. When establishing structural integrity within a posture it is vital to first and foremost address the foundation of the pose. In downward facing dog your foundation is in your hands- how they are meeting the ground beneath them. The structural integrity of your entire body depends upon how you are placing and engaging the bones and muscles of your fingertips, knuckles and wrists. While on all fours allow your fingers to spread apart, let every knuckle make contact with the mat, and position your wrist creases parallel to the front edge of your mat. And now the work begins- focus on maintaining all of this foundational integrity as you lift your hips back and up into downward facing dog. As this foundational integrity becomes easier to maintain with your hips lifted, shift your focus up to the heads of your shoulders and begin mindfully activating the muscles of your arms. Notice how when you spin the biceps of your inner arms towards the front your mat and the triceps of your outer arms in towards the midline, more space arrives in between the vertebrae of your neck, more length is established in your side body, and a deeper opening occurs in your shoulders. Movin on up! Bring your attention to your ribcage. 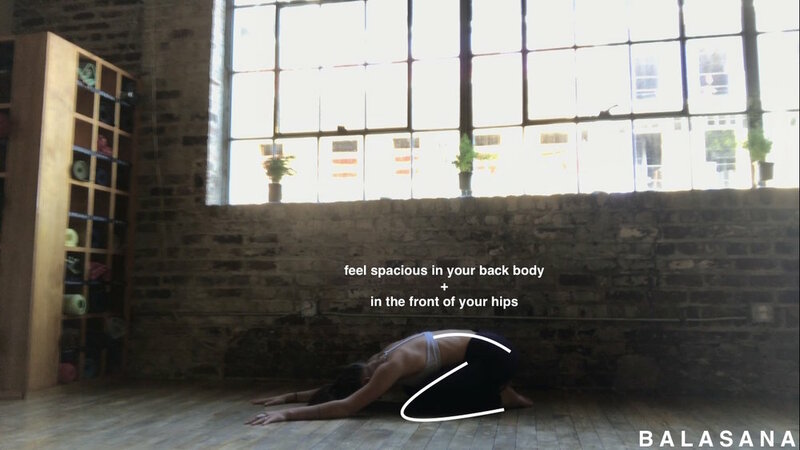 Notice how when you focus on sending your chest back to your thighs, your ribcage tends to flare open and therefore dump weight into your low back as well as strain the fronts of your shoulders. Combat this harm by knitting the front and lower part of your ribcage into your belly on every exhale. Feel this action bring length back into your spine and stability back into your shoulders!